If the best way to predict the future is to invent it, the next best is to give it a helping hand. With this idea in mind, in 2008 SHOWstudio launched the ‘Future Tense’ film season, offering a global platform for an exciting new generation of fashion designers - including Romy Smits. Taking us where no man (or woman) has gone before seems to be one of the necessary remits of Future Tense – and Romy Smits has certainly taken the ‘Future’ element of our project to heart. 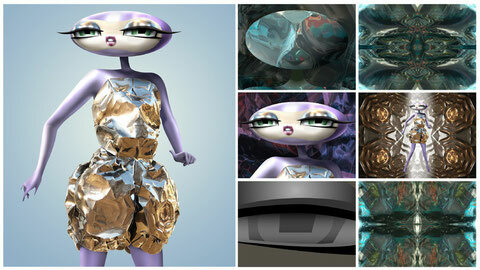 Her collaboration with animator Roland Maas and his cyber-supermodel creation ‘Babelle’ negates the need for both models and clothes, although ‘toonmodel’ Babelle is clad in Smit’s art-couture, while her patterns created a frenetic, psychedelic and slightly hallucinatory fantasy landscape.